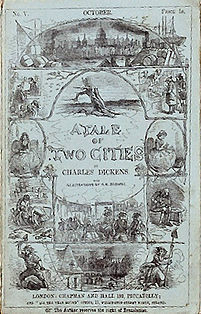 A Tale of Two Cities by Charles Dickens (1859). It was the best of times, it was the worst of times.... These well-known and loved lines begin Dickens's novel set during the bloodiest moments of the French Revolution. When former aristocrat Charles Darnay learns that an old family servant needs his help, he abandons his safe haven in England and returns to Paris. But once there, the Revolutionary authorities arrest him not for anything he has done, but for his rich family's crimes. Also in danger: his wife, Lucie, their young daughter, and her aged father, who have followed him across the Channel. His salvation may be his uncanny resemblance to the dissolute yet nobel Sydney Carton.